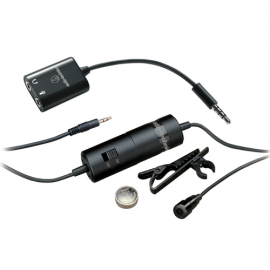 Audio-Technica’s newscaster-style omnidirectional ATR3350iS lavalier microphone is engineered for intelligible, accurate voice reproduction. This high-quality condenser is ideal for video use and is a favourite choice for aerobics/dance/sports instructors. Its low-profile design assures minimum visibility. Included smartphone adapter provides instant compatibility with newer smartphones (Android, iPhone, more).